How does the Fitbit Versa compare to the Ionic? Fitbit are doubling down on the smartwatch category with their cheaper, more mass-market Fitbit Versa. But how does it compare to last year’s Fitbit Ionic? Both the Versa and the Ionic run on Fitbit’s proprietary FitbitOS, so their feature sets are largely the same. The Fitbit Ionic supports FitbitOS apps, comprehensive fitness tracking, music playback over Bluetooth and contactless payments via Fitbit Pay. The smartwatch also supports sleep monitoring, breathing guide and goal setting, messaging, call and social app notifications. Additional apps are available through the Fitbit App store, including Pandora, Deezer, The New York Times and Philips HUE Smart Lights. The Fitbit Versa supports FitbitOS apps, comprehensive fitness tracking, music playback over Bluetooth and contactless payments via Fitbit Pay. Like the Ionic, the Versa also supports sleep monitoring, breathing guide and goal setting, messaging, call and social app notifications. In terms of overall design, the Fitbit Ionic looks more like a traditional Fitbit while the slimmer Versa sits a lot closer to the Apple Watch in terms of aesthetics. The Fitbit Ionic boasts a 1.42-inch inch with 348 x 250 pixels. This is slightly larger than the display on the Versa. The Fitbit Versa boasts a 1.34-inch with 300 x 300 pixels. This is slightly smaller than the Ionic’s display. The Fitbit Ionic boasts Wi-Fi (802.11 b/g/n), NFC and Bluetooth 4.0 connectivity. It also features a built-in GPS - which the Versa lacks. 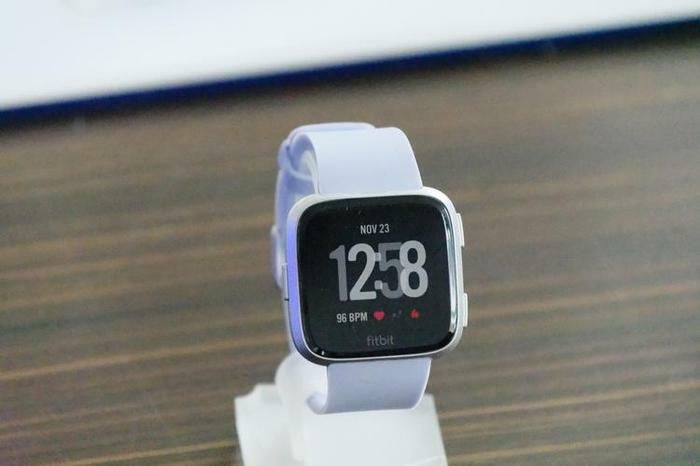 The Fitbit Versa boasts Wi-Fi (802.11 b/g/n), NFC and Bluetooth 4.0 connectivity. However, it lacks the built-in GPS found in the Ionic. The Fitbit Ionic features a 3-axis accelerometer, 3-axis gyroscope, optical heart rate monitor, altimeter, ambient light sensor and built-in GPS. The Fitbit Versa incorporates a 3-axis accelerometer, 3-axis gyroscope, optical heart rate monitor, altimeter, ambient light sensor and SpO2 sensor. The Fitbit Ionic is water Resistant up to 50 meters and boasts Gorilla Glass 3 protective coating on its display. At 58g, it’s slightly heavier than the Versa - but not by much. The Fitbit Versa is waterproof up to 50 meters but lacks the Gorilla Glass found in the Ionic. It's also a little lighter, weighing in at 30g. The Fitbit Ionic is available in 3 colors: Charcoal/Smoke Gray, Slate Blue/Burnt Orange and Blue Gray/Silver Gray. In terms of watch bands, Fitbit sell Classic and Sports Band options for the Ionic (priced at $49.95). There’s also a leather watch-band priced higher at $99.95. The Fitbit Versa is available in 3 colors: black, rose gold and graphite. In terms of watch bands, Fitbit sell Classic Band options for the Versa (priced at $49.95). There’s also a leather watch-band priced higher at $69.95. Finally, there are a range of metal watch-band options that range in cost from $99.95 to $159.95. In Australia, the standard Fitbit Ionic is currently priced at $399.95. There’s also a special Adidas variant available, which comes with a special wristband option unavailable for purchase elsewhere, priced at $449. In Australia, the standard Fitbit Versa is priced at $299.95. There’s also a special edition available, which comes with a special Woven wristband option unavailable for purchase elsewhere, priced at $349.